Hyphenated optical techniques combine different measurement modalities in the one instrument to provide a more comprehensive set of complimentary information for carrying out medical diagnosis. This note describes how Raman Spectroscopy (RS) and Optical Coherence Tomography (OCT) have been combined into one instrument to provide a portable machine in the clinical environment which can non-invasively characterize cancerous skin lesions. OCT provides morphological or structural information and RS provides biochemical information. The two sets of data are complimentary thereby providing a more comprehensive means for diagnosis than either technique provides on its own. The instrument has been developed by a group at Vanderbilt University in the USA . It allows both types of measurement to be made relatively quickly and in a convenient way, i.e. on timescales suitable for a typical clinical environment. Typically one wants to make clinical measurements and analysis on the order of minutes rather than hours to ensure patient comfort. Figure 1: Picture of Hyphenated Raman-OCT system. Raman Spectroscopy (RS) provides a chemical signature of tissue which can discriminate the disease state in a non-invasive manner. It has successfully been used to discriminate non-melanoma lesions (basal cell carcinoma - BCC and squamous cell carcinoma- SCC) from inflamed scar tissue and normal tissue with a classification accuracy as high as 95% . RS typically provides surface information and takes a significant amount of time for successful measurements to be made. Consequently it cannot provide data over extensive areas of samples (e.g. 5 mm x 5 mm) without needing a relatively long time. Long times are generally unsuitable for the clinical situation. A team led by Prof. Mahadevan-Jansen at Vanderbilt University successfully discriminated BCC from inflamed scar tissue and normal skin using the combined RS-OCT instrument . The instrument collects OCT images in real-time which can be used to guide the clinician to specific sub-surface features, where RS can be employed to provide specific chemical and physiological information. Having both morphological and chemical information is of clear benefit in ensuring accurate diagnosis of the skin lesions. Figure 2: Picture of the head. 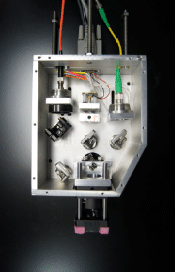 The instrument, shown in figure 1, consists of a combined RS/OCT mobile probe head mounted on a mechanical arm. A schematic of the main components in the head is shown in figure 2. 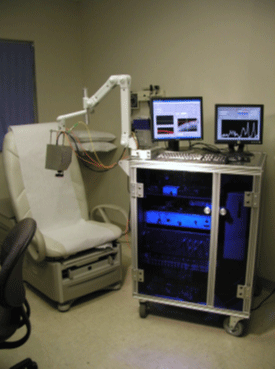 Optical fibers connect the probe to the RS and OCT detection subsystems, which are housed on a cart containing the PC controlling the system. A diode laser at 785 nm, with power of 40 mW, acts as the Raman excitation source. It is contained within the probe head along with the RS and OCT collection optics. The OCT incident and reflected beams are co-aligned by two dichroic beam splitters, and the Raman excitation beam is co-aligned with the incident (and reflected) OCT beams. Both are directed through an objective lens on to the sample using a galvanometer. The galvanometer scans the OCT beam to enable acquisition of the OCT image. Two dichroic mirrors facilitate the delivery of the Raman excitation beam into the optical path for both delivery and the collection of the Raman signal coming back. A fiber is used to couple the Raman signal into a high throughput spectrograph (HoloSpec 1.8, Kaiser Optical Systems), with a back-illuminated, thermoelectric (TE) cooled, deep-depletion CCD camera (iDus DU420A-BRDD) as the detector. The OCT detection subsystem uses a fiber based Michelson interferometer. It consists of a 1310 nm, 7 mW light source which is split by a 50/50 fiber splitter into reference and sample beams. The interference signal is detected by a balanced detector and subsequently digitized. The OCT system gives an axial resolution of 14 µm and can produce images with an area of 15 mm x 2.4 mm (transverse x depth) at 8 frames/second (fps). An axial resolution of 14 µm can be achieved with the OCT system. The focused OCT beam has a lateral spot size of ~25 µm diameter. OCT images and the Raman data are collected sequentially, so when the OCT images have been acquired the Raman signal is then collected from the central optical axis (galvanometer is stopped at this point). The excitation beam is focused to a spot size of ~44 ?m diameter. A dichroic mirror and a long pass filter (√ cutoff = 818 nm from Semrock Inc) is used to separate the Raman signal of interest in the 800 – 950 nm region from the Rayleigh scatter and OCT light. Figure 3: Schematic of system layout. Labview has been used for a custom designed software interface to control the whole system. In operation the system can provide a scan of a potential cancerous skin section in a few minutes and scan an entire patient in approximately one hour depending on the frequency and location of skin lesions. The current standard for diagnosis of skin cancers is visual inspection followed by biopsy and histopathology. This process can be invasive, subjective, time consuming, and costly. Patil et al have demonstrated the successful application of their hyphenated RS-OCT system in the clinical situation – in this case for in-vivo diagnosis of skin cancers – where both biochemical composition and the microstructure or morphology of tissues can be acquired in a relatively short time, and in a convenient and non-invasive way with minimal discomfort to the patient. Acknowledgement: Grateful appreciation is extended to Prof. Anita Mahadevan-Jansen, Biomedical Engineering Department at Vanderbilt University. 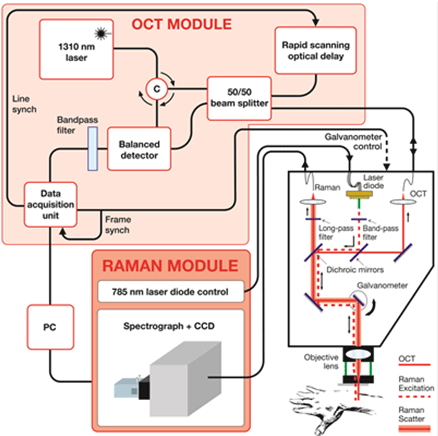 Patil CA, Kirshnamoorthi H, Ellis DL, van Leeuwen TG, and Mahadevan-Jansen A, “A Clinical Instrument for Combined Raman Spectroscopy-Optical Coherence Tomography of Skin Cancers”, Lasers in Surgery and Medicine 43, 143-151, (2011).